Summary: An artist creates a girl named Viva, then, dissatisfied, begins to erase her. Viva grabs the pencil. 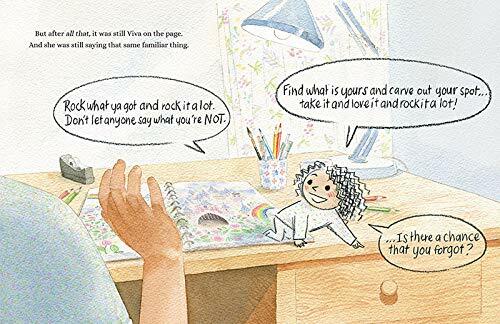 “Excuse me, lady, artist, ma’am/but I like me the way I am./Before you change one line or dot,/can I try…to rock what I got?” Unconvinced, the artist tries tweaking parts of Viva: first her hair, then her body, then the background. 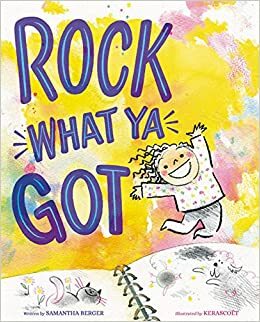 Each time, Viva reappears in her original form, with her reminder to “Rock what ya got!” Finally, the artist remembers a book with that title that she wrote when she was about Viva’s age. She hugs Viva, happy with her exactly as she is, and makes a promise to herself not to forget this line again. 40 pages; ages 4-8. Pros: A catchy line with a good message of self-acceptance and great illustrations showing the artist’s different attempts at altering Viva. Cons: I was hoping there would be an afterword…did Samantha Berger really create such a book for herself as a kid?